Polycarbonate dinnerware is basically plastic dinnerware. The advantage of it is that it is hard to break; in fact, some classify it as unbreakable dinnerware. There are some disadvantages of this type of dinnerware. First of all, it is easy to scratch with utensils, so it does have limited uses. Second, there are some controversial thoughts on the safety of polycarbonate materials in regard to food storage which causes me to question it for being safe for food consumption. Third, it is prone to melting. Nonetheless, there are several polycarbonate dishes available for use if you choose to go that way. FDA studies have found that material is safe. In fact, many Tupperware products are made from this material along with restaurant dinnerware used by many restaurants. 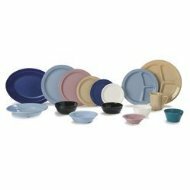 This dinnerware set by Coleman is a great set for camping dinnerware, for picnics or for outdoor dinnerware. Cambro is a well-known company who supplies restaurants with restaurant dinnerware and kitchen supplies such as food containers, measuring cups and tumblers. Restaurant owners love them because they are unlikely to break easily. Breakage of dishes is a major expense in the restaurant business. Does this look familiar? It is a polycarbonate pitcher that is often used in restaurants for serving iced tea, water and juices. I happen to have one that I use that I found at a garage sale. Polycarbonate glasses are ideal for everyday use for families that are hard on dishes. They are shatterproof, so when they get dropped or knocked over, you don't have to worry about getting glass in the food or in your feet, which is a good thing. If you find this type of dinnerware interesting, take a look at over forms of unbreakable dinnerware that you can choose from. To me, there are better choices than polycarbonate dishes. While they serve their purpose, there are different options that are more durable and perhaps more safe.